Monument Valley: located on the boarder of Utah and Arizona looking south on highway 163 from Utah toward Arizona. The sun is setting and the buttes are silhouetted in the distance and the highway of life directs you on toward majestic spires in the distance. The sky is made of quartz crystal the patterns and the color in the crystal direct your eye toward the apex. The buttes are made of dark blue sodalite. The reddish brown patterns in the background flow horizontal conveying distance and a flat plane. The dark patterns in the foreground flow diagonally conveying steep mounds of earth. The frame is handmade. 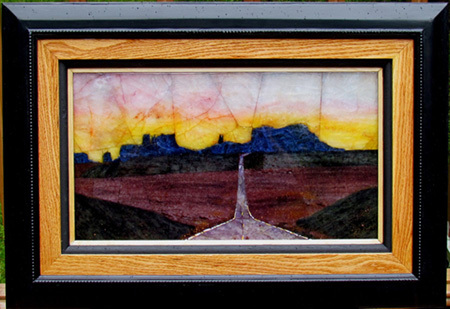 The wood mat is red oak which high lights both the color and patterns within of the scene. Every month I plan on sending out these images in order to promote my artwork. So please share this with your friends and notify me if you wish me to add you my list at eldonconder@hotmail.com. To see other rock pictures go to rock-pictures.com.